We all know that Marketing and Sales have to work hand-in-hand in our quest to grow the business. Yet, there’s often a tension between the two teams. Lead generation and nurturing takes dedicated time and effort. But salespeople naturally prioritize working with prospects and opportunities most likely to close now. Some sales teams are less than impressed by the lead quantity and quality. As a social marketer, you might know that your target audience spends a lot of time on social. But your company’s social accounts are only being used to broadcast company news, and not helping with your company’s lead generation goals. In this webinar, Aseem Badshah, Socedo CEO, explains how to turn social media into an ROI positive channel in B2B organizations focused on demand generation. That means using social to generate new leads and opportunities. – Why social media should not be viewed as just another isolated channel. – How social media helps you grow your database, send better emails, increase the efficiency of your paid advertising programs, and helps to increase ROI on events. – Why social media strategy needs to take into account the entire marketing funnel, not just the top of the funnel. – A roadmap with actionable steps for making social media ROI positive channel for your organization. – How to measure ROI from your social efforts to prove its value in a B2B context. Today, all of us are sharing a lot of information about who we are as professionals through social networks in real time. Twitter and LinkedIn provide lots insights into our prospects and learn about their role, professional interests, who they’re connected with, the influencers and brands they follow, and the events they’ve attended. As a marketer, you can leverage this rich social data to discover new leads and develop campaigns that drive a 5X or 10X increase in engagement rates. •Tracking how social leads engage with your demand generation programs and move through your pipeline. Social media listening tools have been around for a while now. They enable marketers to identify and assess what’s being said about their brand and products. Most marketers understand the benefits of these tools at a high level, including reputation management, generating leads, attracting customers, identifying influencers and improving customer service. But most B2B marketers still wonder, how can I actually use the data from my social listening activities in a way that helps me generate new leads and engage with my leads at scale? •Use social media keywords and organic engagement to trigger actions such as an alert to your sales team, an automated email with a relevant piece of content, an invite to an event, and more. 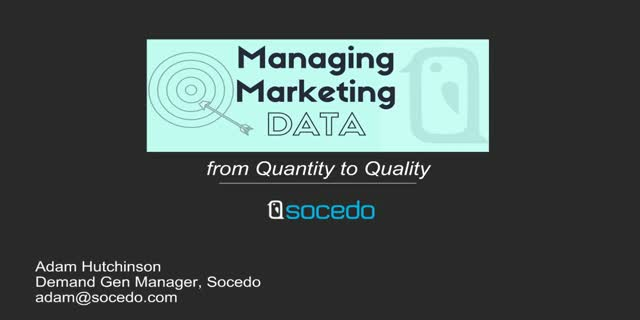 Socedo's mission is to bring social leads to every business in the world. Specifically, we've developed a demand generation system that empowers B2B marketers to discover, engage and qualify prospects through social media to increase revenue at scale.